It is so hard to believe I have less that 200 hours before I complete my nail tech course. I am so excited about it! My graduation date is Jan. 10, 2013. It seems like the course is flying by. I have been learning so much and applying what I have learned. I am trying to get my full sets done more quickly. I have to say I feel like a backfill takes as long or even longer sometimes than a full set. I have to plug a company real quick — on Black Friday I found Kupa was having a great sale. I ordered tons of bits. And they are awesome. I feel like they are really helping me cut down on time. I bought the cuticle safety bit and I love it. You can get so close to the cuticle without cutting! I am always afraid of getting cut so I try my hardest to prevent cutting. I bought the two-week backfill bit, the four-week backfill bit, a fine, a medium and a few others in between. My new bits are the best and I love them. I can tell the difference they make for me personally. I have started working on Christmas nails and it is so fun. You can be so creative. I just went a picked up about 30 new acrylic paints and I am having a blast. I am playing with the blending, which has caused me some stress in the past, but I think it is getting a little easier. 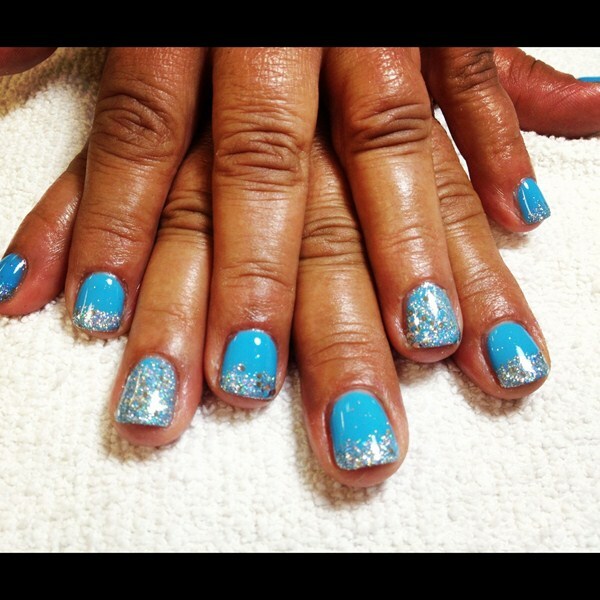 I am also working on the rock star gel nails. It’s a little messy but they are so darn cute. 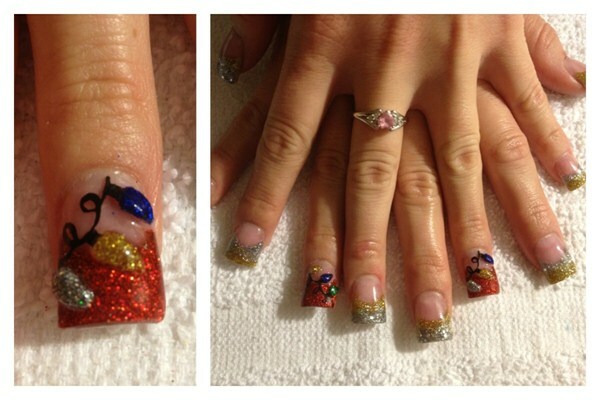 And I love that people without acrylics can get the fun sparkles and glitters. I have included a couple pictures of different sets. 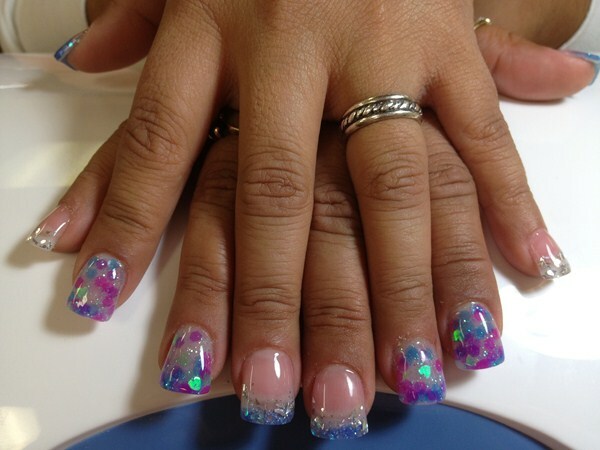 I had a client ask me about what she could do with her pink-and-white nails for a wedding where she was wearing black. As you can see in the picture we made her nails fun and cute and she still was able to wear them with her black dress to an evening wedding. he loved her nails. That was all that mattered to me. And I loved the black 3-D bow. My teacher loves 3-D acrylic and I was never a fan, because she gave us an assignment to follow and copy her work. I couldn’t replicate her roses or flowers. Now I have been playing with it and I have been finding I don’t hate 3-D. I just want to do my own designs. 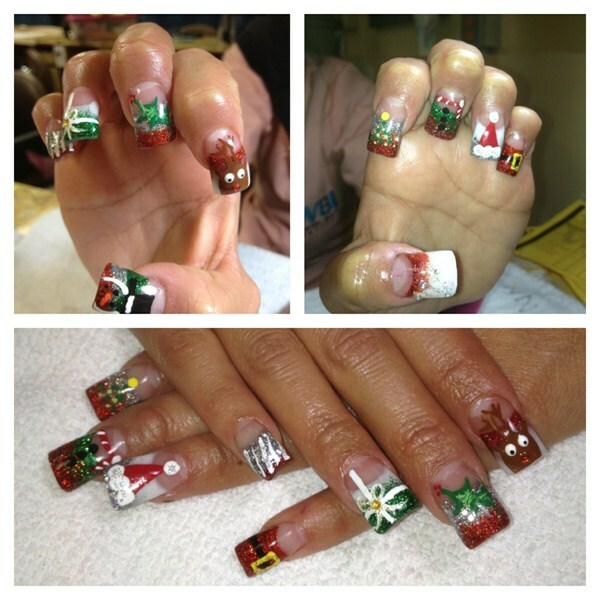 I love the 3-D Christmas lights on the nails. And I have fun doing it. As always I love to read your comments and input. Thanks for taking the time to read on my blog and my progress.